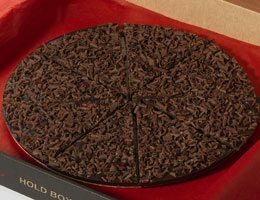 A decadent selection of dark chocolate gifts and chocolate pizzas. Perfect for those that have less of a sweet tooth and maybe a more refined palate, enjoy 70% cocoa in our unique dark chocolate gifts. Our range is handmade in Great Britain, by our lovely team of chocolatiers. We like to be original and offer a unique chocolate gift with that little bit of something different. Take a look at our luxurious dark chocolate gift range and treat your loved one to the finest quality delicacies they’ll ever taste. Dark chocolate is not just a gift, it’s an experience. One small bite heightens your senses and takes you into a place you never knew existed. If you’ve never felt like that then you’ve never tried anything from our luxurious gourmet range. Chocolate Coffee Beans – a whole coffee bean encased in a rich dark chocolate coating. These small drops of heaven are perfect after dinner treats, whether that’s for use in your restaurant or at home with friends. Topitoffs – these are new to us and are taking the UK by storm. 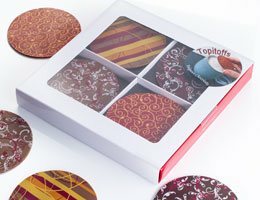 Topitoffs are discs made purely from smooth Belgian chocolate and they sit on top of your hot drink. Whether that’s a coffee, hot chocolate or even a cup of tea, once you’ve had a drink with these, you’ll crave it everytime. 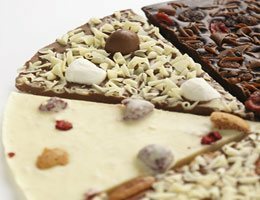 We have a stunning selection of dark chocolate pizza gifts to suit a variety of tastes. A complete circular base made of pure, rich in cocoa, dark chocolate topped with a selection of delicious accompaniments. Fruit and nut, an obvious favourite; more chocolate – brownie, curls and dark chocolate rice balls, raisins and cranberries, or the exciting and adventurous option Chilli with mango flavoured jelly beans. We have an exciting range of flavours that are both indulgent and amazing.